As part of the ‘Making our Mark’ series, the ‘Full Circle’ and ‘Higher Ground/Underground’ digital videos consider the notion of attachments linked to certain locations or walks, built up over time and embedded in our personal histories. These two contrasting constructed environments; a medieval castle moat and a city park and its surrounding streetscape, shaped by human presence could be seen as a reaction against the romantic idyll depicted by Wordsworth and Coleridge. However, some kind of emotional escapism does seem possible amid the artificiality of these unnatural spaces. Influenced by 1970’s video performance art, the actual physical process of ‘acting out’ the walk itself is intrinsic to the work, with the resulting video serving as a record of the activity that took place. 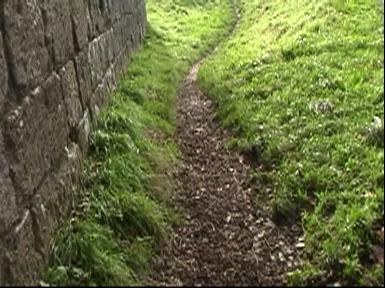 ‘Full Circle’ follows one of Waterman’s favourite circular walks around the grassed moat at Carisbrooke Castle on the Isle of Wight, which is organically shot in one long continuous take. The life-size installation of the video projection, with ample space created in front of the work, allows for immersion to take place, so that the viewer feels as though they too are playing an active role in the walking experience.